Now Archived! PolarConnect event with Mike Penn and Lee Welhouse from the South Pole Station in Antarctica on 17 December 2018. You can access this and other events on the PolarConnect Archives site. Completed infrastructure of an AWS. 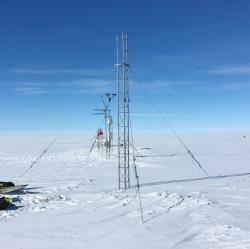 The Antarctic Automatic Weather Station (AWS) network has been making meteorological observations since the early 1980s. This continent-wide network is positioned to observe significant meteorological events and increase our understanding of the climate of the Antarctic surface. Researchers utilize the AWS network to observe and learn about the Antarctic in a warming world. Given the duration of the AWS program and maintaining AWS sites for many years, numerous studies have been conducted on the surface climatology of regions of the continent, such as the Ross Ice Shelf. This climatology also aids in other studies, like winter warming events. 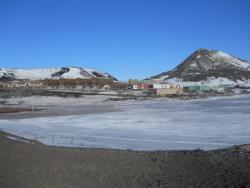 A view of McMurdo Station from Hut Point. Photo by Jacquelyn Hams. Based at McMurdo Station, Antarctica, the team will travel to remote locations. These locations may include the West Antarctic Ice Sheet (WAIS) and South Pole Station. 9 January 2019 This will be my last journal...at least for a while. What’s With the Weather Over There? Most people would describe Mike Penn as having an annoyingly positive outlook, being ridiculously over prepared, being a huge fan of the Oxford Comma and two spaces after a period, and having boundless enthusiasm for all things science. First and foremost, Mike is an enthusiastic lifelong learner. Professionally, he is a teacher of the gifted, Gifted Department Co-Chair and STEM coordinator at Shaler Area School District, a large suburban school district near Pittsburgh, Pennsylvania. He has one of the coolest jobs ever! He runs a spaceship simulator at his school and leads the community of practice of Dream Flight Adventures simulators around the world. He is constantly seeking to create dynamic, challenging and exciting authentic learning experiences that inspire wonder, discovery, and the thirst for learning in his students. Mike pushes the envelope and boundaries of where, how and why learning should occur for all students. Through years in the Army, being a Boy Scout Scoutmaster and a lifetime of being an outdoor enthusiast he has lots of experience in outdoor survival and first aid skills. Living on a small farm he is adept at maintaining, fixing and troubleshooting old and broken machines and equipment. Running a spaceship simulator has made him good at operating and troubleshooting uncooperative technology. When Mike is not daydreaming or teaching, he is enjoying time with his wife and children, reading, learning new things, trying to stay in shape, building stone walls and traveling. His favorite question is "Wouldn't it be cool if…?" He is beyond excited and honored to be chosen to provide this awesome experience for his students! Dr. Matthew A. Lazzara is an Associate Scientist and Research Meteorologist at the Antarctic Meteorological Research Center (AMRC), Space Science and Engineering Center (SSEC), University of Wisconsin–Madison (UW–Madison). He is presently the Principal Investigator of the Antarctic Automatic Weather Station Program. Dr. Lazzara is also a faculty member and Department Chair in the Department of Physical Sciences, School of Arts and Sciences, at Madison Area Technical College. There he teaches courses on weather & climate and climate & climate change. He’s research work focuses on observing the Antarctic from the surface and from satellites to gain an understanding of how Antarctic weather and climate behaves. Dr. Lazzara has deployed to Antarctica 10 times in the last 23 years. Christopher, I'm really glad to have gotten to come to Danville! All 350 students (I saw every student K-8) were very polite and all of you seemed really interested! It was my pleasure.